On Tuesday evening, President Donald Trump took over TVs across the country in a national address on the government shutdown. His address was followed by a Democratic response from Senator Chuck Schumer and Speaker of the House Nancy Pelosi, which, oddly enough, attracted more viewers than the President. The higher viewership on the rebuttal may be part of the reason Schumer and Pelosi came out of the night as the internet's favorite new meme. The impetus for the meme was their plea to reopen the government or the assertion that there's no need for a border wall. It was that they looked like someone's staid parents in a raunchy coming of age comedy. 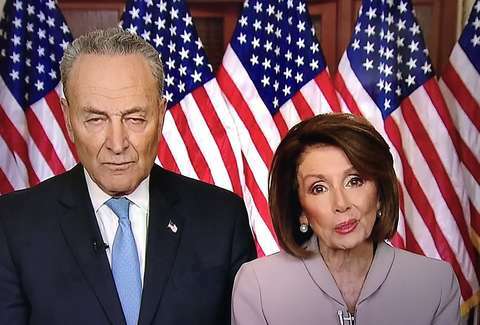 Dour screengrabs of the duo turned into an instant meme that spread quickly across Twitter as people imagined exactly what the disappointed parents might be telling their disappointing child. The memes are pretty damn funny, but it's also worth remembering that the shutdown is genuinely hurting people. Hundreds of thousands of federal employees are going without pay, government contract workers like janitors aren't going to get back pay, national parks are being damaged, the risk of foodborne illness is rising, TSA agents aren't showing up to work, and many tribes have had basic services cut, among other issues.